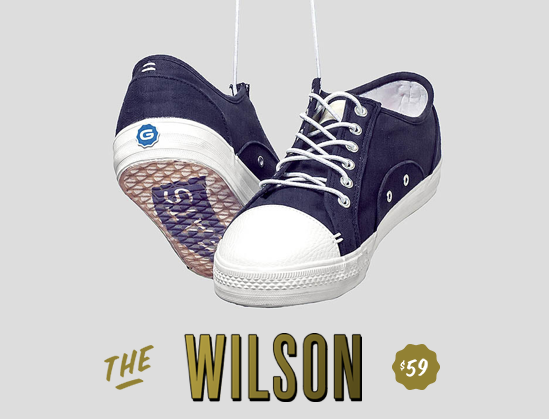 What's not to like about a Chuck Taylor inspired shoe that has; a beautiful leather toe cap, leather-lined EVA foot bed, all canvas uppers, vulcanized rubber sole, brushed metal eyelets, signature Bar Tack detail, a spring loaded lace-lock, and all for $59? The answer is nothing. This is a nice, upscale and fashion forward alternative to the ubiquitous All-Star (not that there is anything at all wrong with a pair of Chucks). If you like this, and are feeling a little more spendy, have a look at their Royale in deerskin leather. You can see and learn more here.